It seems matching scales to a key doesn’t always work! For example, I’ve found simply using a G Major Pentatonic scale over a G-Major song doesn’t always sound right. Why doesn’t that always work? What would you say to help me build a better solo pattern? As I worked on responding to this email, it seemed to make more and more sense to answer it in the way I do in private lessons, which is through listening and participation. And that idea turned into an article, an incredibly dense and cumbersome article by the way, which then turned into this, the first of a series of shorter lessons that will (hopefully) walk everyone through the steps of moving from knowing one’s scales to applying that knowledge to playing solos. This series of lessons is going to be a little different than the others here at Guitar Noise (at least the others up to this point) in that you, the reader, are going to need to do a lot of listening and also quite a bit of your own experimentation. Soloing, as with many other aspects of music, is highly personal. There’s not so much a “right” or “wrong” as there is convention. And taste and style, not to mention achieving the desired musical effect, should trump convention. But before you take those statements as a free pass to playing whatever you want to, take a moment and think. Gaining the ability to listen and the ability to take what’s in your mind and put it out through your fingers into the guitar are going to take quite a bit of practice. The key thing is that you don’t have to start totally from scratch. The more you can tell yourself what you’re trying to achieve, the easier it tends to be to achieve it. So we do need to be able to tell, or at least tell ourselves, something about what we hear and what we want to hear. And that’s where this lesson starts us out. 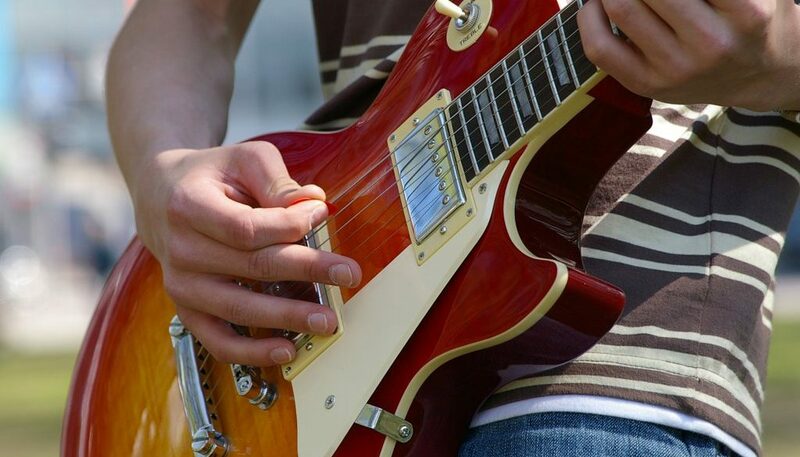 We’re going to listen to the difference between two scales – the major scale and the major pentatonic scale – and to start to appreciate what each scale has to offer. If you’ve not done so already, you may find it helpful to read an old Guitar Noise Guitar Column entitled Scaling the Heights, as a lot of the basic information we’ll be using is covered there. It also will not hurt you to know how chords are formed, so you might also want to brush up on that with a quick read of The Power of Three. All right, then? For this lesson, we’re going to use a very basic (and very standard) chord progression, the I, vi, IV, V progression that you can hear in tons of songs (Stand By Me or Last Kiss probably being ones known to many of you). We’ll be playing this in the key of C major, so that means that the chords will be C, Am, F and G.
Many guitarists automatic abandon the major scale, though, for the basic reason that pentatonic scales are easier to play. In most positions, you rarely need more than a stretch of three frets to play them. And the patterns of the pentatonic scale, especially the “Root 6” pattern (where the root note is on the low E (sixth) string), are fairly easy to remember. To make the major pentatonic scale, we take the notes at the Root (“I”), second, third, fifth and sixth positions, so the C major pentatonic scale would consist of C, D, E, G and A. Two things I want to point out – first, the object here is not to copy what I did. It’s to simply play around and to get used to the position of the scale, not to mention to get used to how the pentatonic scale sounds as a tool for soloing. And that brings us to the second point – for the sake of this exercise, I’m not worrying about doing anything fancy. There may be a bit of a slide here and there, but no bends, no double stops, nothing remotely requiring any type of technique other than finding the notes of the scale. That’s kind of why it sounds like someone practicing a scale as opposed to a “solo.” Hopefully, not totally so! This is an issue we’ll address in a later lesson in this series. For now, though, let’s move on to getting our ears and heads working a little more. I can’t say how true this is for all of you, but I find the sound of the C major pentatonic lead a little, shall we say, “lacking.” It’s not that it doesn’t sound okay; rather it just doesn’t seem to live up to its potential. And when we make a closer examination of what’s going on, it’s not all that hard to see why. Let’s take a look at the notes that make up each chord of the progression, shall we? Remembering that the C pentatonic scale consists of the notes C, D, E, G and A, we see that, when we’re playing along with the C and Am chords, every note of the chord is accounted for in the pentatonic scale. But when we play the F and G chords, we’re missing a note in each. There’s no F in the C major pentatonic scale, so when we play along with the F chord, there’s no root note (F) to nail the chord down and give it a nice foundation. And when we play the G chord, we’re missing the B note, which determines whether the G chord is major or minor. Plus, the B note is the “leading tone” of the C major scale – the note that pulls our ears to the home tonality of C.
Again, I can’t stress enough that this is a matter of personal taste. To my ears, using the entire C major scale sounds a lot more interesting. There are more opportunities to create interesting uses of dissonance (more on that in upcoming lessons! ), not to mention using the B note to create chord variations – played over the C you get Cmaj7 and played over the Am you get Am(add9). Try thinking about it this way: your solo is a painting and your scale is a pallet of colors. In this lesson, we’ve done two paintings, one using five colors (the C major pentatonic scale) and one using seven colors (the C major scale). Both certainly work, but if I were to ask you which scale is the “right” one to use, what would you say? It really depends on what you’re trying to paint. So the first lesson we need to learn is this – it’s one thing to know our scales; it’s another matter entirely to have an awareness of what they can do. Or to know which one to pick or how to even determine how to know which one to pick. Part of this can be learned – convention dictates that some things just go together well. But part of it is also a matter of taking the time to listen and to experiment with what you know. Not to mention to continue to learn new things in order to have more with which to experiment. Download this MP3 file to your computer and use it as a backing track while you play around with both the C major and the C major pentatonic scales. Feel free to noodle aimlessly at first, but once you’re comfortable, try to listen seriously to yourself (recording yourself isn’t a bad idea!) and to how you may gravitate towards one of these two scales more than the other. Also, take the time to get very comfortable with both of these scales! We’ll be using them as examples in the next upcoming lessons in this series, so having them in your fingers can only be a good thing! Extra credit if you know the note names in position! This is a very well written lesson. I can see it helping lots of people! I have found that- unfortunately- one of the best ways to start getting solos together is to…well…start soloing. You don’t really know what interesting (or uninteresting) noises you will make unless you actually do it. Sometimes convincing students to make that leap of faith is the biggest step. Amazing – I just started taking guitar lessons (after playing for over 40 years) and this is exactly what my instructor was teaching me last time. Work the C major scale over the chord changes rather than the basic pentatonic. David’s presentation is excellent and the examples and backing track are very helpful. Just gotta do it. That was probably the most useful lesson that I have ever had. I studied classical guitar in college and can read quite well. I learned my triads from book so I could play with the Jazz group, but I could never improvise. Now I can a little. Thank you very much. David — Great lesson man…lots of detail and a full explanation. Applied scales is a difficult topic to grasp and teach, and I don’t think I got the hang of it until my 3rd or 4th year of playing. Great series of lessons! I like the way you break it down to bite size chunks, which makes it easier for us older fellers to digest! Other instructors always want to throw as much as they can at you in a short period of time. This just leaves me bewildered and frustrated. The only issue I have is technical. I can’t seem to download the MP3 files onto my computer, which would be really helpful to enable me to play them directly through my G-DEC amp. Can you include an easy to use link? I would like to download the mp3s that are embedded in your lessons. Any tip how I can do that? Do I need to download an mp3 downloader program? Would appreciate your kind response. Thanks. Finally, you can download the MP3s again. I’ve been trying to make it so the examples work on as many devices as possible, whether it be a phone, a tablet, or a computer. After a bit of trial and error I see there are still some things to work out. Let us know here in the comments if you have any trouble downloading the MP3s. I right clicked on the download mp3 link and selected “save link as” and it plays no problem in my G-DEC amp. Looking forward to continuing the lessons so I can hear it other than on a laptop. Got the download working now. The “Save Link As” was not working before. Many thanks. I’m not a guitarist per se, but I was just looking for something to read when I stumbled upon this page. I’m the keyboardist of my band, and do rhythm guitar every once a while, when needed. This article helped me work on my keyboard and piano solos. Thanks David, really great work. It is well said that chord progression is important. It also needs to follow the notation. I listened the way of chord progression. It is really excellent. Natural way of playing should be preferred rather than copying. Look how you feel comfortable then go for playing. This is amazing, very easy to digest. Thanks David. Very helpful. I’ve been putting off scales for 9 years, and this is just what I needed. After years of guitar playing, I’ve devoted countless hours to learning a lot (like really a lot, more than just a few 4 note chords, some fundamentals behind how scales fit into them, and the theory behind basic modulation) and in the end I found myself giving in to the Pop and sticking to the pentagon if because I could never understand how my idols managed to intentionally apply any of the concepts I devoted so much time to read about. I guess some musicians with more natural musical inclination were able to pick up on the types of things you point out in this article as though they were obvious consequences of key ideas in musical theory. Unfortunately they were lost on me, and after being exposed to just a page of your insight on the first scale taught in a first-year music course, everything clicked and I feel like I’ve finally been allowed in on the secret I was missing that all these great players seemed to know. Thank you so much. I can’t express how frustrating it is – being unable to figure out why everything I try to add to my playing only seems to work when ‘they’ do it.